Huawei phones are premium, in early 2018 Huawei launched a budget smartphone with full HD+ 5.6″ 18:9 ratio display and dual camera setup at the back. The Smartphone was named as Huawei P Smart, Now as per the leaks the Company is launching the next version of the same P smart phone, and they might name it as Huawei P Smart 2019, it could be a big upgrade upon the last version. 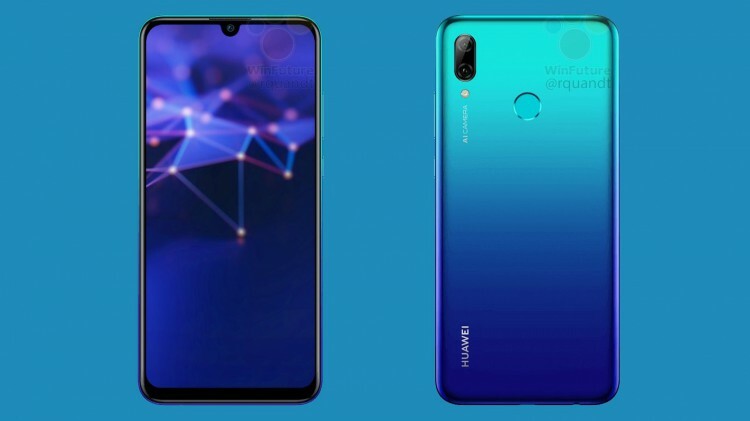 The Phone is expected to get launched in early 2019, The Huawei P Smart 2019 will feature a 6.2-inch full HD+ (1080 x 2340 pixels) LCD screen with waterdrop notch to house the selfie camera. It is powered by 12nm octa-core Kirin 710 SoC which features four Cortex-A53 cores and four heavyweight Cortex-A73 cores coupled with 3GB/4GB of RAM and 32GB/64GB of storage expandable via MicroSD card. In the Camera department there is a dual camera system at the back which reminds “AI camera”. It could feature a 13MP + 2MP camera as seen in Honor 10 Lite and a 24MP selfie camera. The Smartphone will be running on EMUI 9.0 based on Android 9.0 (Pie) and it may come packed with a 3,400 mAh battery with fast charging support. Huawei could offer gradient color options like Midnight Black and Aurora Blue. Although the official specifications are not yet shared by Huawei but they are likely to be the same as above. The phone could also feature a 3.5mm Headphone jack, It will be interesting to see what Huawei offers in this budget smartphone, Comment below your thoughts and stay tuned with Alloftop for more updates.